Free 1 John 4:8, God is love print and color page. I drew this for my kids at church. It could be given out as a take-home project after class or Children's Church, or as a class project to fill in the Bible hour. It is 1 John 4:8 which says "Whoever does not love does not know God because God is love." 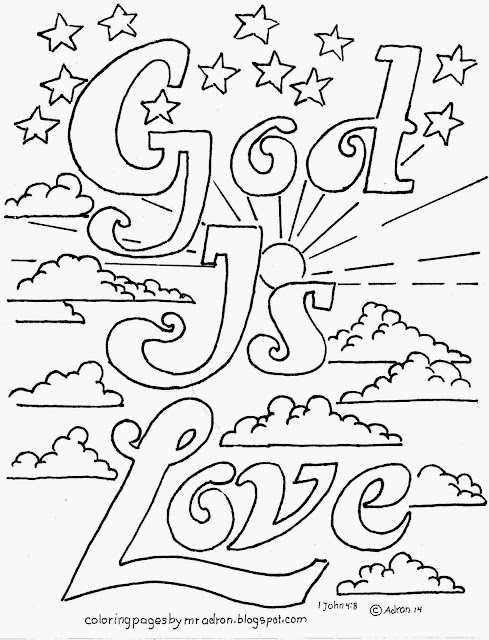 God Is Love, 1 John 4:8 Coloring Page. 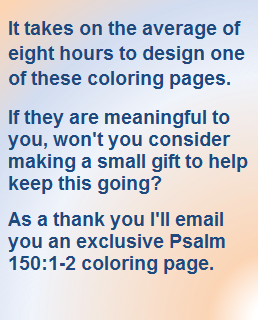 These coloring pages are free but your gift will help keep this blog going. Choose your gift amount. Here are two links that may print better on some printers. For a file in a photo format CLICK HERE. It is a good verse to memorize, children and adults can use this coloring picture as an aid to memorizing the verse. There are a lot of things a young artist can do to have fun with this picture. The lettering is large to give ample room to fill in. The stars and clouds can be warm hues and the background blues, lavenders and violets. There is a sun and sunbeams can be yellow, orange, and red. To see more coloring pages like this click search the sidebar. To find more like this search the list of labels in the sidebar or choose from the most popular listed in the sidebar. I am sure you will find one you will like. Use the buttons below to share this post. Thank you.